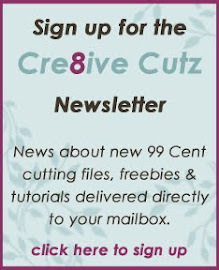 Cre8ive Cutz - 3D SVG Cutting Files for Electronic Cutting Machines: How to Create a Silhouette Cutting File in Make the Cut! 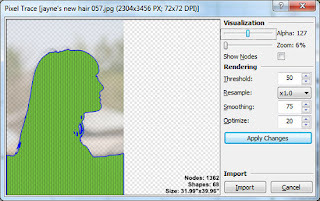 How to Create a Silhouette Cutting File in Make the Cut! I saw a request on the MTC Facebook page for tips on how to take a photo and make a silhouette cutting file out of it, so I took it as a challenge to create a little tutorial. The screen shots from Make the Cut! are from the most recently released version, which is available for download here. Position your subject in a shaded area with a very bright light source in the background. A darkened room with one window that has daylight coming through works well. Try not to have any dark colored objects near the subject, so they don't end up touching in the photo. In my sample photo, my daughter was standing in an underpass tunnel with the light coming in from one end. Adjust your camera settings so the camera is exposing for the light, not your subject. The method to do this will vary with different cameras. With a point and shoot camera, this will likely happen automatically, as long as your flash is turned off. With a SLR camera, take your light reading from the brightest area of light, and again, don't use flash. 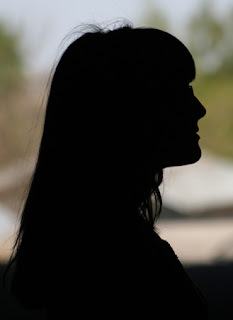 The resulting photo should have the subject in silhouette as shown, with good contrast between the subject and the background. 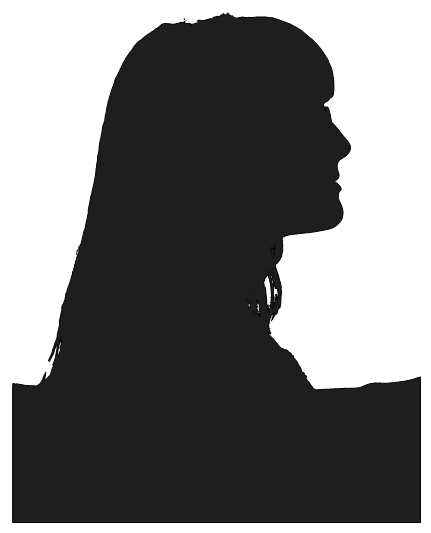 For best results, your subject should be as dark as possible and there should be no facial features showing. If you have access to photo editing software, you can increase the contrast between your subject and the background, if you choose, for even better results. The photo I'm using as an example is straight out of the camera, the only software I used was Make the Cut! 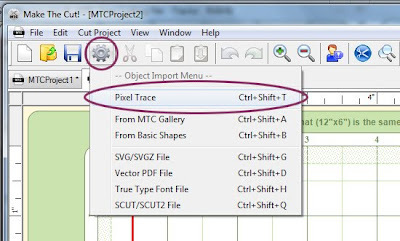 In Make the Cut!, click on the Import Objects icon, then select Pixel Trace, as shown to the right. Select your silhouette photo from the folder window and click Open. Adjust the trace settings until your traced silhouette is how you want it. 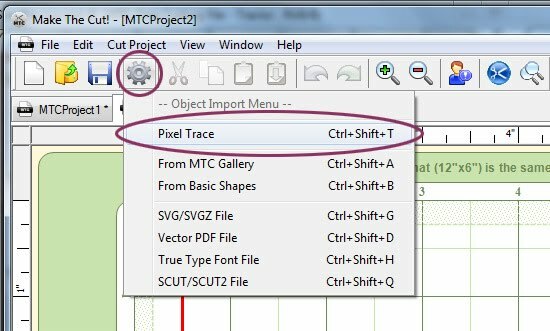 Each time you change a setting, click the Apply Changes button to see how your changes affected the trace. The screenshot below shows the settings I used to get my results. 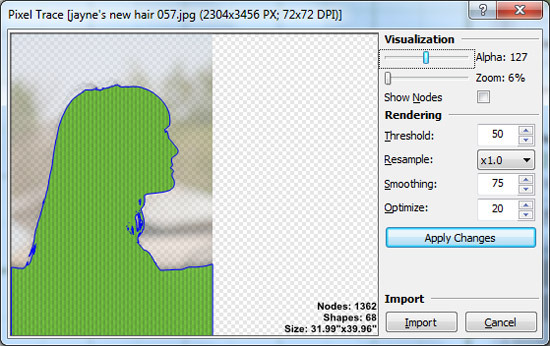 Once you are happy with the results, click Import to add the silhouette cutting file to your mat. That's all there is to it! Here is my finished result. Her hair is a little rough on top due to flyaways, but if you are planning the photo (this one was taken before I even knew MTC existed! ), you can ensure that everything is nice and smooth for best results. You are awesome. Thanks for sharing. If I can get the kids and the dog to sit I am going to give this a try. Thanks again (& for great directions.) I'm going to pop a sheet on the clothesline and try this. Alternatively, you could resize the photo in another photo editing software before bringing it into Make the Cut!, but I wanted to show the process without any other software in the middle, as not everyone has photo editing software. Thanks for the info! I wanted to try this but was not sure how to start. this explains it nicely! !